The first Substation contract for Sterling reached completed last week at Ipswich Road in Slough. Sterling Services provided the brick faced precast panels using both Forterra blue and smeed dean bricks that were pointed at our factory prior to delivery. 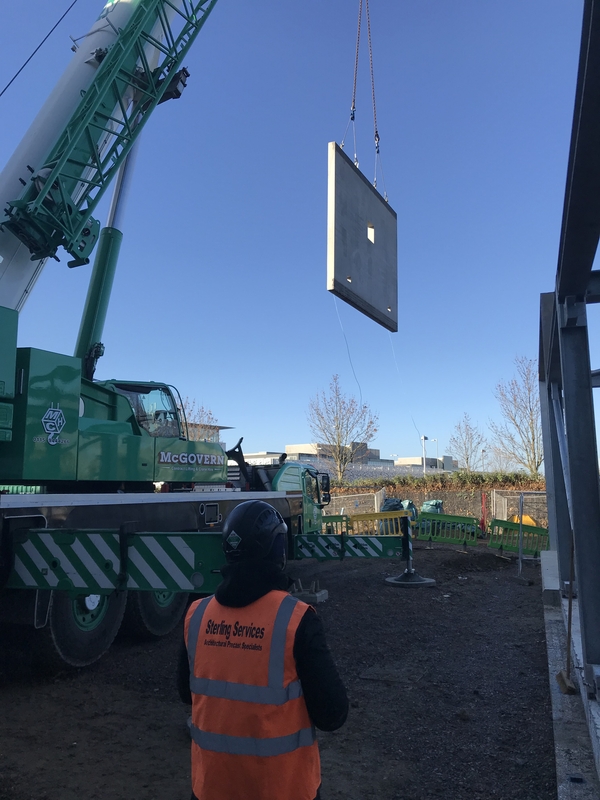 Sterling were able to manufacture large panels at over 4mtrs high, these required a specialised “V” frame trailer for delivery and use of a 100T crane for installation on site. With the installation of this project taking a mere 2 days to complete, it serves as a good emphasis for the benefits that precast concrete can offer. Off-site manufacture such as this is increasing in demand for good reason, with savings on the cost of on-site labour and materials, reducing installation time and eliminating the effects of bad weather on productivity all giving the client better control over the project. Add to this the better thermal performance, fire resistance, noise reduction and low maintenance durability that precast offers compared with traditional building methods and it becomes clear why so many clients are turning to this material.